When I began mapping out our itinerary for this summer’s road trip through Charlottesville, VA; the Great Smoky Mountains and Gatlinburg, TN; Asheville, NC; and Greenville, SC; I unofficially dubbed our vacation “The Biscuit Tour.” I imagined daily breakfasts and lunches laden with biscuit baskets, wiping buttery crumbs off my fingers at every stop, and rolling home with all the secrets to baking my own Southern biscuits like a professional. Truth is, I only ate three biscuits the whole week we were traveling, so distracted was I by other pursuits. (Hiking the Great Smokies past bear cubs to striking waterfall vistas, hanging out at silly little shacks like Monticello and Biltmore House, what have you.) And two of the three were from Asheville’s Biscuit Head. 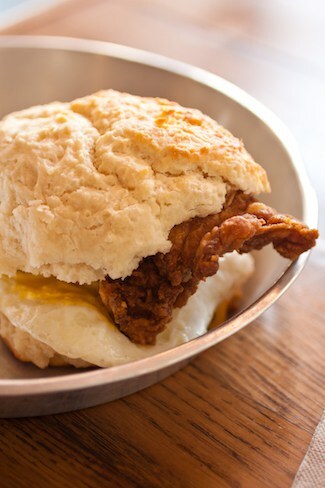 Almost every dish at the breakfast-and-lunch-only joint spotlights their renowned cathead biscuits, a Southern drop biscuit style so named because they’re as large as the noggin of this fine, furry fellow. These are not petite little appetizer biscuits, if you catch my drift. 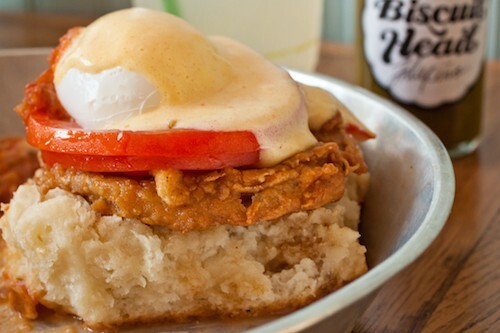 Biscuit Head’s only been open for a little more than a year, and already it’s a staple of the culinary community. But it’s not just the biscuits that pass muster here: the accompaniments and add-ons threaten to steal the show from the plump pastries. Based on what I saw during our breakfast at the original Haywood Road location on West Asheville‘s main drag, the line constantly forming at the walk-up counter is equally a product of the restaurant’s popularity and the crippling indecisiveness that hits when you’re forced to decide whether you want sweet potato coconut gravy, jalapeño pimento cheese, mimosa fried chicken, sriracha slaw, or smoked chèvre grits with your biscuit. Or maybe all of the above. 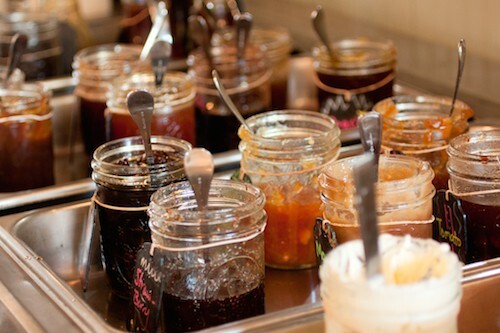 Or you could just get an unadorned biscuit and go to town at the toppings bar, stocked with dozens of homemade jams in flavors from cantaloupe vanilla to bananas foster; flavored butters like lemon tarragon and chocolate mint; and dried fruits and syrups. Being a guy who appreciates order and simplicity (and who doesn’t always like all the goopy, runny components of his food to touch each other on the plate), Dan went with the build-your-own-biscuit sandwich option. His sandwich, filled with a slab of warm mimosa fried chicken, egg to order, and melted American cheese, was slightly more manageable than my towering meal of tomato upon tomato upon biscuit. I would have never been able to exercise such restraint. Though I could barely finish sopping up the last eggy, rich bites of biscuit in my aluminum pie pan, it was impossible to resist the allure of the toppings bar (not to mention the excuse to eat another biscuit) in the end. 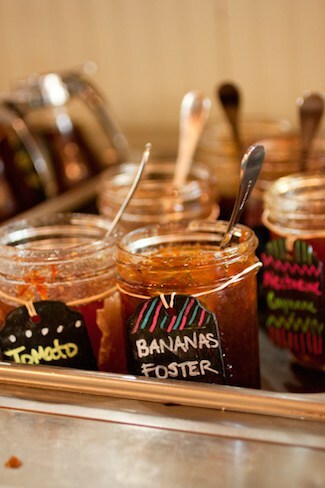 I bought two more biscuits on the way out and filled a few to-go cups with nectarine-cayenne and tomato-cinnamon jams. Eaten cold for breakfast the next morning, it was just as ethereal. Biscuit Head,733 Haywood Rd, Asheville, NC. Open 7:00 am-2:00 pm Tues-Fri, 8:00 am-3:00 pm Sat-Sun.